Welcome to the worlds of basic roleplaying, where Chaosium has collected in one place rules and options for one of the most influential role playing game systems in the world. 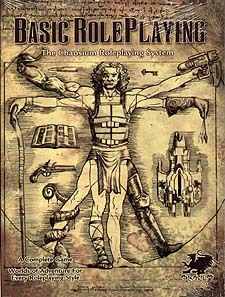 Basic Roleplaying was designed to be intuitive and easy to play. Most Basic Roleplaying mechanics are simple and logical. Virtually all rolls determining success or failure of a task are determined via the roll of percentile dice. * The system is remarkably friendly to newcomers. It is easy to describe the basics of the game system to non-gamers. * Players of other game systems find Basic Roleplaying to be much less mechanistic and less of a barrier to the actual act of roleplaying. * Most of the information players need to know is present on their character sheet. * Characters evolve based on practicing the skills they use the most, and do not arbitrarily gain experience based on ephemeral elements such as levels or experience ranks. * Combat can be quick and deadly - often the first blow to land is the deciding blow. * Basic Roleplaying is remarkably modular: levels of complexity can be added or removed as needed. The core system works equally well with considerable detail as it does with minimal rules. * The internal consistency of Basic Roleplaying allows for rules judgments to be made rapidly and with little searching through the rulebook for special cases.